For todays card I combined 2 stamps and the direct to paper technique to create this fabulous masculine or general purpose card. First I chose about 4 color of inks (marina mist, midnight muse, old olive and so saffron) and randomly “swooshed” them across a piece of whisper white cardstock. I started with the lightest colors first. 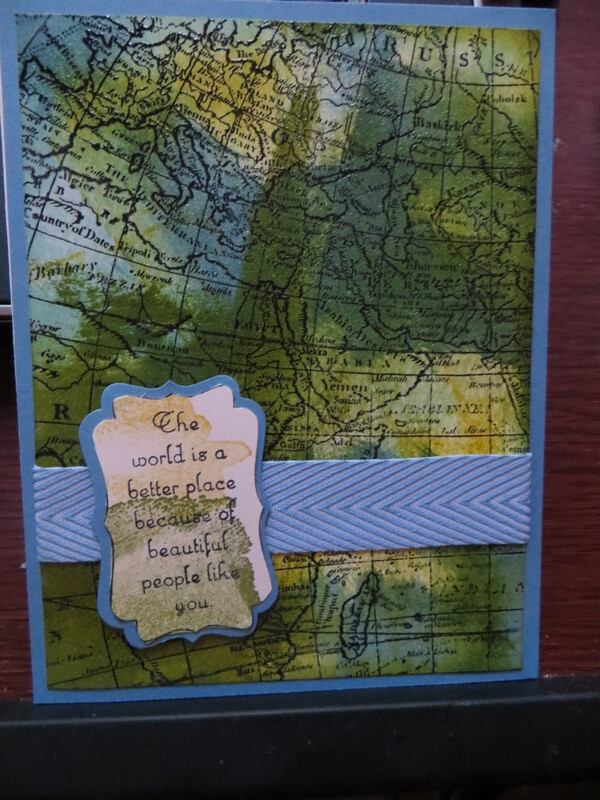 Once I covered the whole card front, I embossed the World Map#130345 in black powder. I then stamped the sentiment from the People Like You #133215 single stamp from the Stampin Up occasions catalog and then hand cut it out and then mounted it on a decorative label #120907 punch. I added a piece of the super soft and sweet Marina Mist Chevron ribbon #130016. Today’s cards are the same concept because Cammie wanted to use her powders that she purchased a year ago – Pumpkin pie #123106 and Tempting Turquoise #122950. 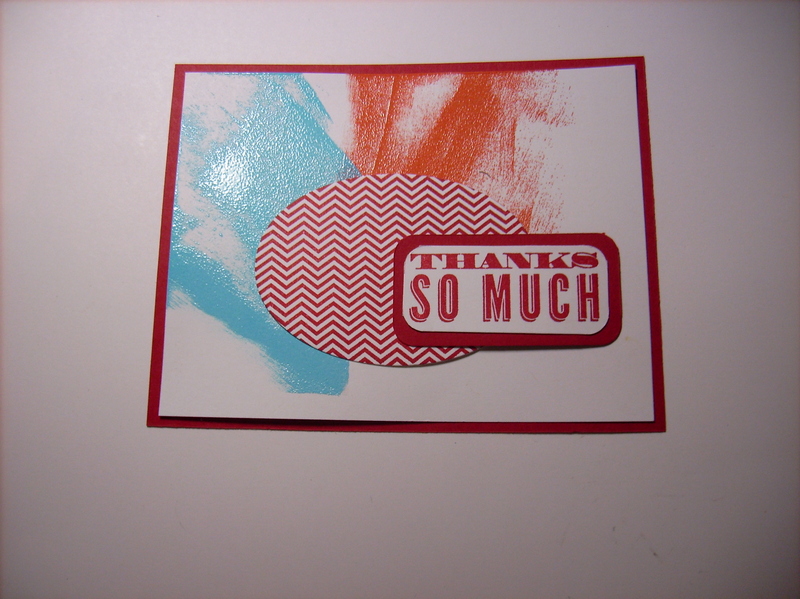 She swiped versa mark in 2 directions directly on the whisper white and then embossed them in turquoise and pumpkin pie. The oval was stamped using the Oh, Hello #130733 stampset and then cut using the Ovals Framelits collection #129381. She added a sentiment and created a quick card. 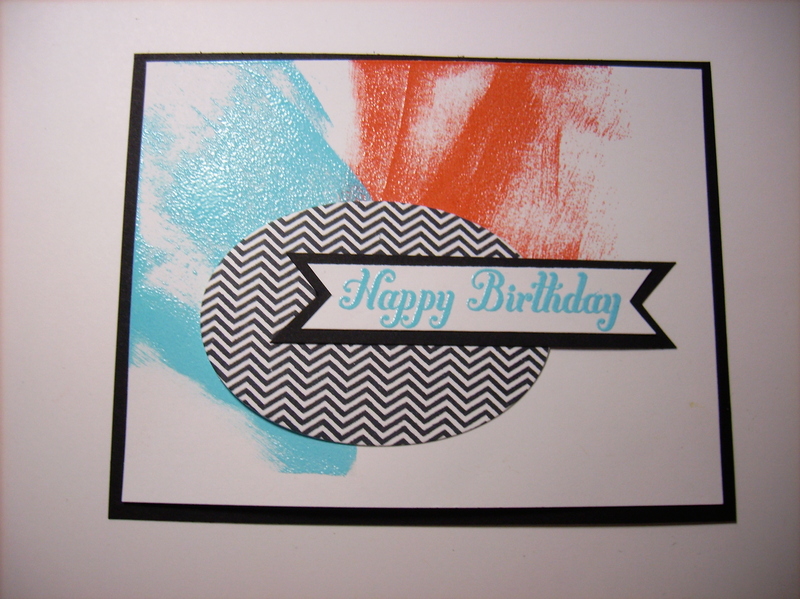 This card features another inking technique called direct to paper. 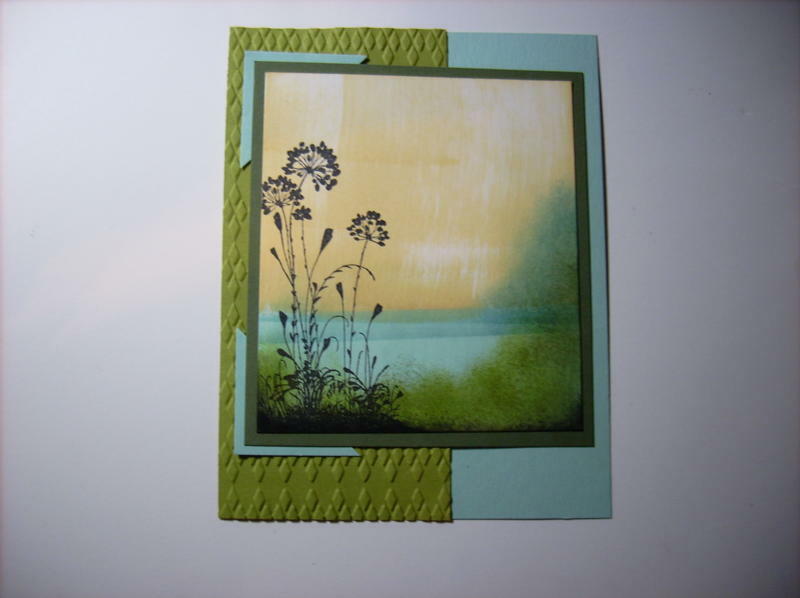 The yellow sky was created simply by taking a daffodil delight ink pad as swiping it directly on the white cardstock. The lake was masked off and then brayered with shade of blue inks. the greenery was created using the daubering and sponging techniques. Finally the floral image from the Serene Silhouettes stampset #127324 was embossed in black and then the panel was matted on black and applied to the pool party base and squares. 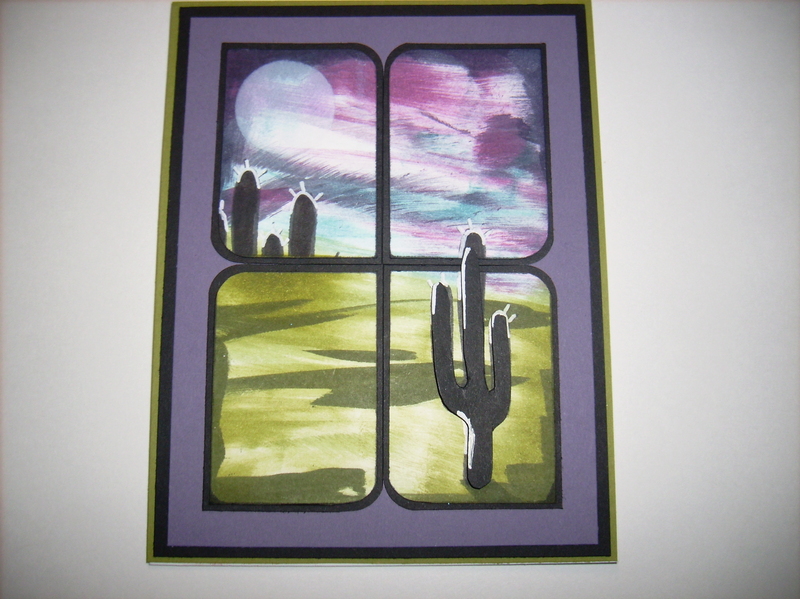 Today’s card is a real beauty that Cammie made using the direct to paper inking method to create the pond. 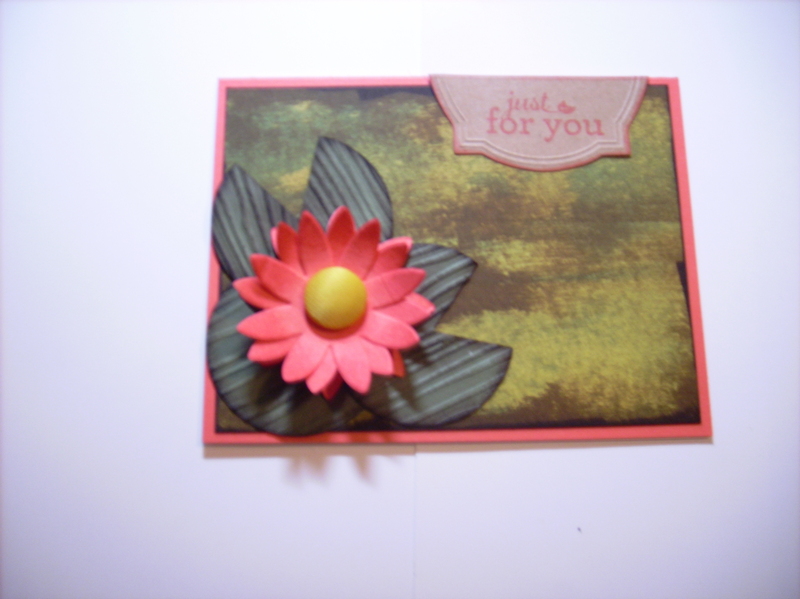 She created her lily pad using a textured circle with a wedge cut away, The and water lily and sentiment are from the Pop Up Posies Designer Kit #131395. What a creative way to use this fun kit.